•	We recognise that terminal illness requires support and understanding and not additional and avoidable stress and worry. •	Terminally ill workers will be secure in the knowledge that we will support them following their diagnosis and we recognise that, safe and reasonable work can help maintain dignity, offer a valuable distraction and can be therapeutic in itself. •	We will provide our employees with the security of work, peace of mind and the right to choose the best course of action for themselves and their families which helps them through this challenging period with dignity and without undue financial loss. 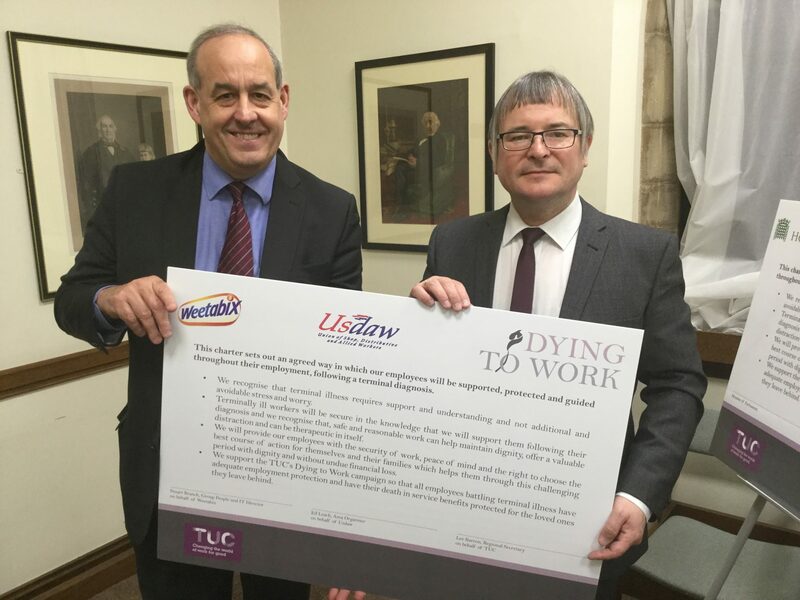 •	We support the TUC’s Dying to Work campaign so that all employees battling terminal illness have adequate employment protection and have their death in service benefits protected for the loved ones they leave behind. Being told you have a terminal illness is devastation beyond words. Many people facing such a diagnosis will be searching for support and that comes in many forms. One of which is from the employer. They have a duty of care of their employees and I want to see as many businesses in Delyn sign up to the TUC’s charter so that their workforce are safe in the knowledge that their employers will provide a compassionate environment for them. If you are an employer you will no doubt be wanting to provide the best environment for your staff. Upon hearing that one of your team has been diagnosed with a terminal illness I am sure that you will want to support them in any way possible. One way to do this is by signing the Charter. Families and friends no doubt care for those with a terminal illness. But we often forget the role of the workplace. I want to thank the TUC for bringing this charter forward.